A Jinni led the army’s investigations into the alleged explosion on the presidential yacht, Finifenmaa, in September 2015, says a police statement leaked sometime in the morning of 2 March 2016, an extraordinary day in the life of Maldives. The ‘Finifenmaa Blast’, as the curious incident on the president’s yacht came to be known, is portrayed in official discourse as an assassination attempt on President Yameen—allegedly masterminded by now jailed Vice President Ahmed Adeeb. At around 15 years of age, Mamdhooh meets a visiting Malaysian by the name of Abubakuru (last name and current abode unknown) who teaches the boy to summon Jinnis. Using skills learned from Abubakuru, and the Qur’an, Mamdhooh now helps people shake off wicked spells cast against them by enemies. A few days after the Finifenmaa Blast, Chief of Defence Major General Ahmed Shiyam recruits Mamdhooh as a member of what seems to be a Top Secret Investigative Team personally led by the Major General. The first meeting between The Chief and the Jinni Whisperer takes place outside Senahiya, a military hospital in Male’. The Chief picks Mamdhooh up in his car. “I want you to find the truth in the Finifenmaa Case”, says The Chief. Mamdhooh does not charge for his services. They arrange to meet again. When The Chief meets Mamdhooh the following day he has a list of things he wants: the dirt on persons in military detention; the dirt on Vice President Adeeb; and, he wants to know: is it true there are weapons hidden somewhere in Male’? The two men meet every day for the next three days. Each time The Chief asks Mamdhooh to summon a Jinni to get the information he wants. “I don’t do that,” Mamdhooh wants to avoid summoning a Jinni. But The Chief insists until, on the third day, Mamdhooh relents. “I will need someone trustworthy from the MNDF”, he says. “That’s impossible”, replies The Chief. Mamdhooh needs a Medium, a body into which the Jinni can be summoned. With no one the Chief of Defence can trust at the MNDF, he has to ask his own circle. He finds a friend of a friend, a young man named Zihan Ahmed. Mamdhooh met Zihan when he helped the mother of his friend, Mohamed Ubaidh Ibrahim, get rid of the evil eye four years ago. To summon the Jinni, Zihan will need to be laid down somewhere private. The Chief, along with another top army official, a Shad Sir as he is referred to, provide Mamdhooh with a suitable location. A building under construction near the post office. One night soon after, on a date and time unknown, the three meet to get the hurly burly done. Zihan Ahmed is worried about allowing the Jinni to enter and reside within him. Mamdhooh comes to a compromise with him—the Jinni will only speak through Zihan, he will not be allowed inside Zihan’s body. The ritual begins: Zihan is on the floor, Mamdhooh is holding his index finger and places a hand on his forehead. “You must give me the first answer that comes into your head”, he tells Zihan, and recites several Sura from the Qur’an. Chief of Defence Major General Shiyam begins interrogating the Jinni. “Yes” to both, says Jinni. The session ends here, whether due to lack of cooperation from the Jinni, or other pressing military matters The Chief has to look after, it is not said. The next session is held about three nights later, same location. “Is there any involvement of a former President in this?” The Chief resumes the official interrogation into the alleged assassination attempt. “I don’t have any names”, says the Jinni, via Zihan. The Chief begins naming former presidents. The Chief and the Jinni Whisperer meet at the MNDF headquarters. The national security risk is high — military intelligence reports say there could be weapons stashed away in different parts of the country. The Jinni’s services are desperately required to protect The Sovereignty. The Chief says weapons could be hidden on any of the 1200 islands in the archipelago. It is too big a territory for Mamdhooh’s Jinni, which needs a list of suspect locations to choose from. The Chief points to the island of Hibalhidhoo, Bodu Kaashihuraa and another with a name now forgotten. Jinni says Hibalhidhoo is the most likely. 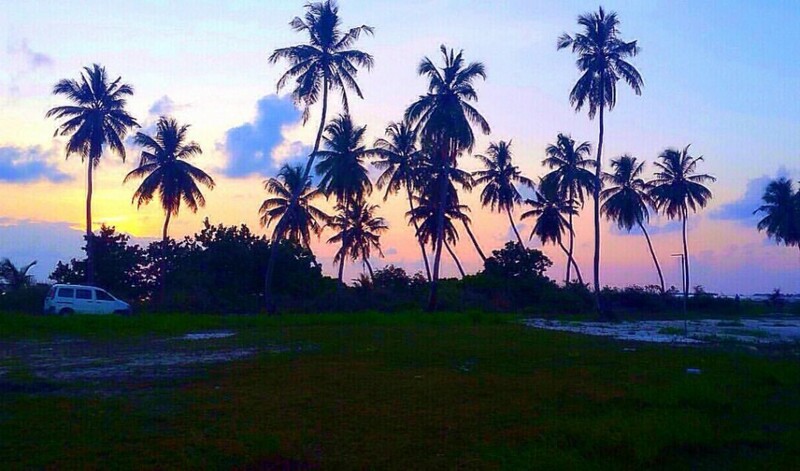 Next day, the army finds weapons at Hibalhidhoo. “There could be more”, The Chief wants Mamdhooh to summon the Jinni for verification. “I can’t do that from Male’.” Mamdhooh’s Jinni does not have as wide a jurisdiction as the MNDF would like. Mamdhooh is at home one night soon after when The Chief provides him with an MNDF Special Forces uniform which he puts on before departing for Hibalhidhoo. Dressed in the army uniform, the Jinni Whisperer is taken on board a vessel which stops at the prison island of Dhoonidhoo en route. When they arrive on Hibalhidhoo the prisoner is blindfolded and brought to the beach, which Mamdhooh says is the best place for his Supernatural Interrogation Techniques. “Tell me what you know,” Mamdhooh says to the prisoner who has been sat on a chair. Mamdhooh places his hand on the prisoner’s knee and starts reciting a Sura from the Qur’an he says is known to make people spill secrets. He recites the Sura 98 times before handing the prisoner over to the police and joining an MNDF team on a tour of the island. They check many locations but find nothing and return empty handed to Male’ around sunrise. The Jinni Whisperer, who has a brother in the army, finds out a day or two later The Chief wants his services again. The prisoner subjected to Supernatural Interrogation on Hibalhidhoo is now talking, and is giving reason for The Chief to suspect there may be explosives and weapons hidden in various parts of Male’. The Chief needs the Jinni to zero in on exact locations. He says the President of the Maldives himself would like Mamdhooh to look into it. While Mamdhooh is engaged in this new mission, he receives word from The Chief that explosives may have been planted somewhere along the President’s usual travel route in Male’. “Look deeply into this,” says The Chief. “I cannot, until you give me the President’s route.” Mamdhooh’s Jinni, characteristically, needs to get precise information to give precise information. 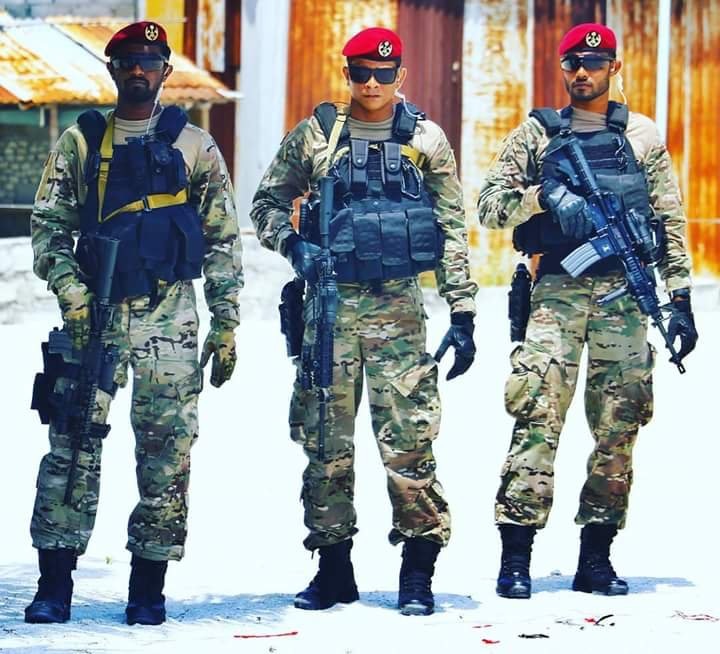 Around 22:00 hours the same night, the Maldives National Defence Forces’ Supernatural Investigation Squad—Mamdhooh The Jinni Whisperer, Chief of Defence Major General Shiyam, Shad Sir, a soldier going by the name of Dunk, and Mamdhooh’s army brother—travel around Male’ together. The Chief identifies the President’s usual route. Obviously such information is shared only with top military intelligence, like Mamdhooh, the Jinni Whisperer. The National Security is very important. “If there is anything, it will be on top of street electric boards; between such boards and walls; in vehicles parked in the area; in dustbins of garages in the vicinity; and it is likely they will planted at eye-level”, Shad Sir tells Mamdhooh as they drive around near Mulee Aage. The former presidential palace, Mulee Aage, would have been the official residence of the President had he not chosen to live in his own home at great expense to the taxpayer and much inconvenience to neighbours. As it is, he frequently uses it for party functions and other unknown business. Mamdhooh has a lot to do. He goes home, performs a prayer, says several prayers, and recites many Sura including one that he repeats 4444 times. He knows the location that comes into his heart following the ritual would be where a suspect device is likely to be hidden. “Around the burial ground near the Friday Mosque, to the east of the military headquarters,” the Jinni Whisperer tells The Chief. This is the location he sees from his third eye. “Give me the precise location”, says The Chief. The next day, 2 November 2015, Mamdhooh is busy most morning looking after a sick mother, and with other family chores. Around 15:30 he goes to the Beauty Shop to buy some Kalhu Bokaru, black frankincense. He needs to hold some in his hand when walking along the President’s travel route, making his recitations, looking for an IED. Unfortunately, the shop is out of its Kalhu Bokaru stock and Mamdhooh continues without. He bumps into Zihan Ahmed (The Medium) and another friend, Tholhath Mohamed, twice. “Where to?” they ask, the usual Maldivian greeting for someone you meet on the street. “I am on a Mission”, Mamdhooh tells them. Not long after, he meets another friend. The Mission is on hold for the next twenty minutes as the friends catch up. Just as he resumes his walk he bumps into The Medium and his friend. They laugh. Mamdhooh continues on The Mission, reciting and walking beside parked vehicles on Nooraanee Goalhi. There, on the battery of a Pick-Up (or a mini-truck) parked around the corner from Mulee Aage, he notices a black bag. He lifts a corner and peeps in, sees a number of wires inside. When his brother comes, Mamdhooh points him to the bag. A short distance away, he can see Shad Sir and Dunk, watching. [You may remember them from the Supernatural Interrogation Team on Hibalhidhoo.] Mamdhooh points them to the suspect device, too, and hangs about the area. The ‘network jammer vehicle’ the MNDF uses in the president’s security arrangements arrives, and army personnel are soon active in the area. The army’s bomb disposal team say the suspected explosive is connected to the battery. Mamdhooh watches them attempt, and fail, to ‘take X-Rays of the device in situ’. They decide to transport the device to the football stadium in Maafannu, put it inside a container and place it in the MNDF vehicle. 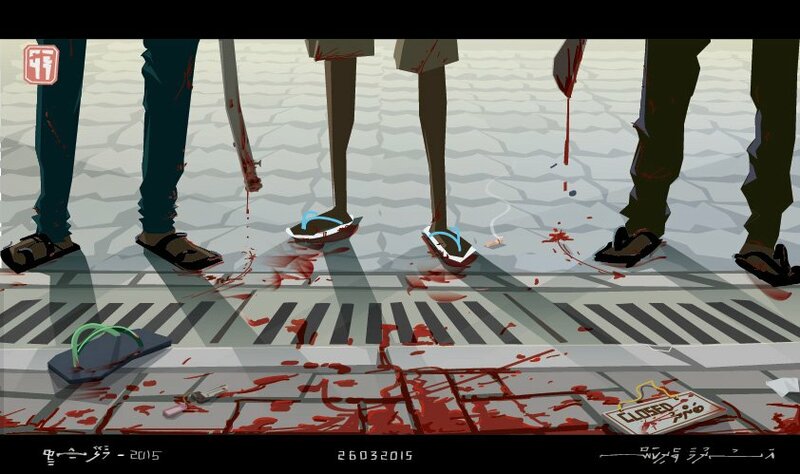 Mamdhooh watches as the vehicle pulls away, to travel halfway across the crowded, always busy streets of Male’–with what they are said to believe is a ticking time-bomb. Mamdhooh is told, and he believes, the container is designed to cause minimum damage in case the bomb explodes en route. He accompanies the army team, and the live bomb, to the stadium. “It is not an explosive”, he learns shortly after. “It is an explosive”, it is decided soon after, and handed over to Police Forensics to check. Mamdhooh watches as the forensic team works. Suddenly, storm clouds gather, and weather takes a turn for the bad. Mamdhooh decides to go home but lingers to hear a conversation Shad Sir is having on the phone. He remembers the tail end of it. Mamdhooh and his army brother, Dhonbe, are home when Dhonbe gets a phone call. “It is a stick dynamite”, Dhonbe is told. He is to go to the stadium area to help defuse it. Mamdhooh joins Dhonbe. They are en route when they learn of a mind-change: the device is to be taken to Girifushi, an island about 17 kilometres from Male’ the army uses for training. They return home then, and Mamdhooh knows nothing of whatever takes place later that night. The following day Dhonbe shows him some video footage from the stadium area but the picture quality is so bad, Mamdhooh does not notice anything significant. Later, Shad Sir shows him some footage on his phone. In this one, Mamdhooh sees himself walking and Ahmed Zinan (The Medium) and Tholhath Mohamed [the same two people he encountered twice when he was looking for an explosive the previous day] coming behind him on a motorcycle. “Did you have anything to do with planting an IED anywhere on the President’s route?” Mamdhooh says he asked the pair when he met them near the park. The army now wants its Jinni Whisperer to identify who planted the explosive. They give him a list of suspects with photos. He points to one. Later, he finds out the person he identified is ‘Superman’ (of no other known name or abode). Soon after, for reasons unknown, Mamdhooh becomes a suspect in planting the alleged bomb. As do his friends Zihan, The Medium; Tholhath Mohamed; and Mohamed Ubaidh Ibrahim. Mamdhooh, who knows how to use the Supernatural to get what he wants, and his three friends remain in prison. It is not known why Mamdhooh has not summoned the Jinni to help them escape or prove their innocence. 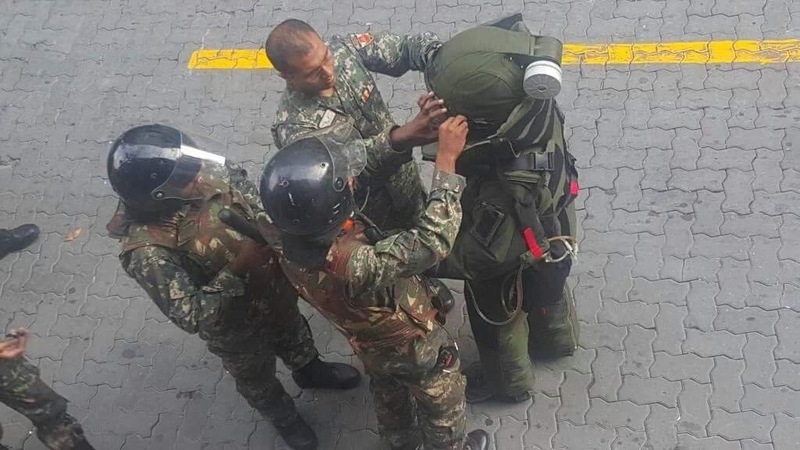 It is possible the Maldives National Defence Forces have other, more powerful, Jinnis working for them. Author’s Note: All the information in the above article is taken from a statement made to the Maldives Police Service by Ahmed Mamdhooh during their investigation into his alleged involvement in the incident. A copy of the statement was leaked to the media on 2 March 2016. This is a summary of stories that made headlines one day (2 March 2016) in the Maldives, where living is often chaotic, absolutely without justice, devoid of security and increasingly lacking in civil and political freedoms. While packed with more than the usual amount of drama, this kind of day is increasingly the norm, and provides some insight into the far from ‘heavenly’ lives of ordinary Maldivians. – Murder in a swamp. – Jinni leading bomb squad. – Gov’t giving free lightsabers to each household. Shortly after sunrise, Aminath Mohamed walks over to her brother’s corner shop near her home on the island of Hithadhoo in Addu Atoll. The shop door is open and the lights are off. Aminath senses something is not right. She goes to the shop every morning after Fajr prayers. Her brother, Ali Abdulla – Ayya as everyone calls him – has run the shop for 15 years. His habit is to keep the shop open through the night. He usually leaves in the early hours of the morning, and Aminath comes in to switch the lights off when daylight arrives. Ayya leaves the night’s earnings in a drawer behind the counter, to deposit at the bank when it opens at 11:00 a.m. Today, the drawer is sitting on the chair, removed from its place behind the counter. There is nothing in it. Aminath’s suspicions grow: something bad has happened to her brother. Ayya’s family is used to him staying in the shop through the night. But he is always home to take his only daughter to school. But not today. Aminath Ali phones the police. Three hours later, around 8:00 in the morning, a woman finds Ayya’s body lying face down in a taro farm not far from the shop. Ligature marks around his neck suggest he had been strangled. His body is bruised, indicating possible assault before death. The close-knit family is devastated. More than a robbery gone wrong, Aminath Ali tells reporters. Premeditated murder, she thinks. On the island of Gan, in Laamu Atoll, a 60-year-old woman with special needs is just beginning what she expects to be another normal day when a masked man enters her house, attacks her, and sticks a finger so deep into one of her eyes she may not be able to see from it again. Two young children are in the house at the time of the attack. Details of the why and who are not yet known. Police are said to be investigating. Said to be. In Male’, around 9:30 in the morning, 53-year-old Abdulla Faiz is at Masjid Al Thaqwa catching up on a missed prayer when a man attacks him with the intention of robbing his phone. In the ensuing altercation, the attacker bites into Faiz’s left ear. He chews off a part of it and spits it out on the ground. The attacker, now known to be Asim Ibrahim, a 24-year-old career criminal with a long police record, is caught and detained by others in the mosque. This time the police have the perpetrator because he is handed to them. That does not guarantee Faiz will get justice: many strange things happen on the road from police to prosecution. Stranger things happen in the courts. With the right judge, at the right price, Asim Ibrahim can soon be a free man. Around mid-day, over at the Raalhugan’du, Male’s beloved surf spot, police are busy arresting a number of surfers: for surfing. Behind the arrests is the surfers’ audacity to protest against the ‘China-Maldives Friendship Bridge’, to be built between Male’ and the airport island, Hulhule’. The government has failed to live up to its promises to publish and inform the public of environmental impact assessments made. It has also failed to provide evidence of its claim that rigorous scientific research has been done to prove the popular waves will not be broken by construction of the Friendship Bridge. There is one report publicly available which speaks of wave assessments done by a Chinese company in a controlled environment, provides a long list of negative environmental impacts the bridge will have, suggests there are socio-economic benefits that should outweigh the damage, and ends with something like: the government wants a bridge so it will go ahead anyway. Why should anyone protest? Protest is uncouth, unsuited to PPM’s ‘local democracy’, so dispersing them engages most of police effort and energy. Protesters are criminals the police take most seriously. Police are investigating. Not just said to be. An earthquake in Indonesia triggers a Tsunami warning. It is called off soon after; before the religious conservatives are able to dust off and bring back out their ‘God’s Wrath’ lectures that worked so well on the frightened population after the 2004 Tsunami. As night falls, the Supreme Court of the Maldives, which prefers to work in the darkness of the night, issues quite possibly the world’s most angry, resentful and petty statement against Amnesty International so far. The Supreme Court bench which, like the entire Maldivian judiciary, sits extra-legally having breached Article 285 back in 2010, is angry with Amnesty for a recent report criticising its total lack of independence. And for defending former president Mohamed Nasheed convicted of ‘terrorism’ after what most of the world agrees was a ‘grossly unfair trial’. To criticise Amnesty for ‘getting personal’, the Supreme Court gets personal, pointing fingers at ‘individuals who run Amnesty International’, suggesting Amnesty is an organisation without principle, subject to the whims of individuals. Just like the Maldives Supreme Court. Amnesty’s criticism of the continuing practice of flogging in the Maldives is ‘Islamophobic’, ‘racist’ and ‘spiteful’. The statement refers to over ’50 sovereign nations’ that hold Islamic jurisprudence in high esteem; it does not mention few of them practise flogging as a punishment. The Maldivian People (a proper noun, in bold) have been happy and content to be flogged for the past 800 years – why are the white people coming in and defending them? The only reason would, of course, be to ‘vilify, humiliate and harass’ the Maldivian People for choosing to believe in Islam. Why would any white Infidel person or organisation criticise another if not for being non-white and Muslim? This is the world we have decided Maldivians should be happy to live in, says the Supreme Court. A world which must be clearly divided between Us and Them, Muslims and Infidels. Us good, Them evil. That said, the Supreme Court is very happy to work with the international community and ‘warmly welcomes criticism’. Through the day runs one story that make people cry or laugh, or both, or frighten them out of their skins, depending on their approach to the Supernatural, national security, and policymaking. This is a story that deserves a chapter and verse all of its own. Follow this link for it. *On Saturday 5 March, a suspect was arrested in connection with the murder.